“My First Triathlon” (MFT) is a program for those planning or thinking about their first triathlon experience. Long time triathlete, Caroline Whitby who has a background in physical education will provide guidance and leadership to the group. Participants will receive a beginner level training program to follow and have access to club workout options with coaching support. Designed for busy people it can be adapted to personal schedules. 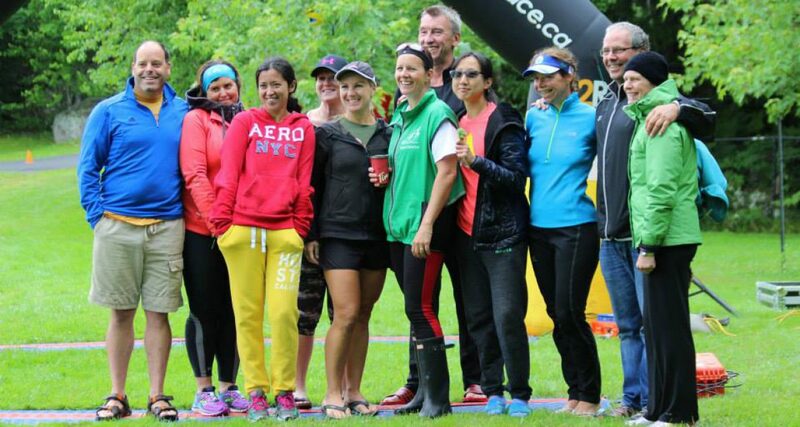 The MFT group will meet with Caroline once per week to cover different topics relevant to “newbies” so that participating in an early season triathlon can become a reality! Topics will include but not be limited to: gear/equipment, transitions, nutrition, staying injury free, and triathlon rules. It is recommended that participants are already capable of swimming 400m (16 lengths of Acadia Pool), can cycle for 45 minutes and run or run/walk for 20 minutes. 1) Re My first Tri Cost: $75 for non Blomidon Multisport Club (BMC) Members / $35 for BMC to Cost is $35 (+ $40 BMC Membership) as you did for the run program it makes it clearer. BMC Club Membership Cost is the same for recreational fitness and single sport participants (e.g. triathlon, cycling, swimming, running, etc.). If you wish to race in a certain sport you will be need to personally get a membership or race day licence for that specific activity. Triathlon members are covered by Triathlon Nova Scotia (TriNS) Insurance. The TriNS membership fee for 2016 is $40 and must be purchased separately (at this time). Those taking part in triathlon specific workouts (bricks, open water swims, clinics, etc.) are REQUIRED to have a current TNS membership. TNS membership benefits include insurance and TNS sanctioned race discounts (e.g. insurance fee waived) is very confusing Those taking part in triathlon specific workouts (bricks, open water swims, clinics, etc.) are REQUIRED to have a current TNS membership. Thanks. Changed it. Multiple people posting and we were going to try to get sanctioned to try to get a coaching course when we thought we could have a “triathlon team” under BMC. Turns out Sarah has been working her magic on Tanya.